Tuesday, March 5, will be the last day of production at the General Motors Lordstown, Ohio, plant as the last Chevy Cruze sedan rolls out of the 6.2 million-square-foot complex, halfway between Cleveland, Ohio, and Pittsburgh, Pennsylvania. The closure of the iconic factory, the scene of many battles by militant autoworkers in the 1970s, is a corporate crime, added and abetted by the United Auto Workers (UAW) union. The plant, which was opened in 1966 and once employed up to 13,000 workers, had been reduced from three shifts to one before its closure. Last Friday was the last day of work for hundreds of Magna Seating employees in nearby Warren, Ohio, who posed for pictures with the last seats made for the GM car. Thousands of other workers in supplier plants, trucking companies, local restaurants and other workplaces are also expected to lose their jobs. The closure is part of GM’s move to close assembly plants in Detroit and Oshawa, Ontario, and two transmission plants in Warren, Michigan, and Baltimore, Maryland, as part of plans to eliminate 6,000 production and 8,000 white collar jobs in North America. This is part of a global restructuring that includes plant closings and layoffs in Brazil, Russia, China and other countries. Many Lordstown workers have already been forced to make the difficult decision of transferring to other GM plants hundreds or even thousands of miles away, leaving behind relatives, friends and communities where they had established deep roots. The shutdown is the most recent in a long line of attacks on jobs in the Mahoning Valley in northeastern Ohio, which includes Lordstown, Warren and Youngstown and was once known for steel production and related manufacturing. Since the Black Monday closure announcement of Youngstown Sheet and Tube on September 19, 1977, the valley has lost nearly one-fifth of its total population. Mill closings throughout the 1980s cost the region roughly 40,000 manufacturing jobs. This resulted in a spread of poverty, substandard housing, collapsing school systems, and an opioid crisis that will only worsen now. In early December, five children died in a house fire on Parkcliffe Avenue in Youngstown just a few miles from the Lordstown GM plant. Meanwhile, the death toll in Ohio from drug overdose has been staggering, with 4,854 deaths in 2017 alone. According to a recent study by the Ohio Alliance for Innovation in Population Health, the combined loss of life expectancy in Ohio between 2010 and 2016 due to the opioid epidemic was more than 500,000 years. This includes approximately 30,000 lost years of life in the eastern counties of Mahoning, Trumbull and Columbiana around the former industrial centers of Youngstown and Warren. In Trumbull County, where the plant is located, the total reached a record 135 deaths for 2017. 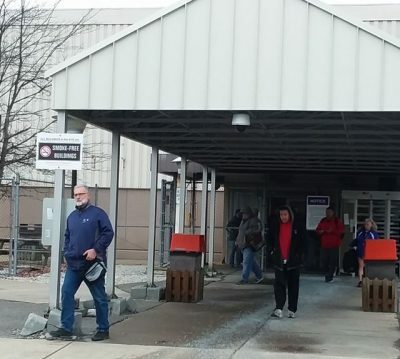 “It is not just affecting workers at the plant or just the city of Youngstown, a veteran Lordstown worker told the WSWS Autoworker Newsletter‚ “It is devastating a wide area; communities, families. People are being forced to leave behind relatives, wives, parents who are ill. The Lordstown plant was the scene of a three-week strike in 1972 over grueling speed-up for the production of the Chevy Vega compact car. The strike was a rebellion, particularly of young workers, against GM, which laid off 300 workers while increasing the line speed from 60 to 101 cars per hour, the fastest line speed in the world at the time. In the decades since then the UAW has done everything to stamp out any resistance by autoworkers to the destruction of jobs and ever greater levels of exploitation. The transformation of the UAW into a direct instrument of management was rooted in the inability of nationally based unions to respond in any progressive way to the globalization of production. In the name of increasing global “competitiveness,” the UAW has overseen the destruction of hundreds of thousands of jobs and imposed one round of concessions after another, including the introduction of multiple tiers and the spread of part time work. At the same time, the UAW has sought to divert opposition to its collusion with the auto bosses by blaming job and wage cuts on workers in China, Mexico and other countries, even though these workers are facing the same attacks. In exchange for policing the workforce, the automakers have funneled billions of dollars over the last four decades into the coffers of the UAW through a network of corporate-union training centers established in the early 1980s. This has included the recently revealed direct bribery of union officials to obtain favorable contract terms from Fiat Chrysler. Through its retiree healthcare trust, the UAW also holds 100 million shares of GM stock, currently valued at around $4 billion. According to its latest filing with the US Labor Department, the UAW has just over $1 billion in assets, even though the number of dues paying members has plummeted from 1.5 million in 1979 to 431,000 today. During the same period, the number of hourly autoworkers employed by Detroit’s Big Three automakers has fallen from 750,000 to barely 150,000. Last year, UAW vice president for General Motors Cindy Estrada signed multiple Memorandums of Understanding behind the backs of workers that enabled GM to bring in low paid workers from its subsidiary, GM Subsystems, at Lordstown and sub-contract workers at its Lake Orion Assembly plant north of Detroit. The express purpose was to replace higher paid senior workers with a lower paid, essentially casual, workforce. The wave of GM plant shutdowns takes place under conditions where the company is raking in bumper profits. In 2018, GM posted third quarter pre-tax earnings of $3.2 billion, with an 8.8 percent profit margin, a 25 percent increase over the same period in 2017. North American earnings rose from $2.1 billion to $2.8 billion. The plant shutdowns and other job cuts will transfer to GM shareholders another $6 billion in cost savings while destroying more than 14,000 jobs. Over the last four years, the company has spent more than $10 billion on stock buybacks—almost double its cost-savings from mass layoffs—in order to boost the fortunes its richest shareholders. From the first announcement of the plant closures the Socialist Equality Party and the World Socialist Web Site Autoworker Newsletter insisted that the fight to defend jobs required the development of the independent initiative of workers in opposition to capitalism and the “right” of corporate owners to close plants and devastate workers’ lives. We insisted that such a fight had to be developed independently of and in opposition to the pro-corporate UAW. The only organized opposition to the plant closings has been mounted by the WSWS and the Steering Committee of the Coalition of Rank-and-File Committees. On February 9, the committee and the WSWS Autoworker Newsletter held a demonstration at General Motors headquarters in downtown Detroit insisting on the defense of all jobs and a fight to win back all lost concessions. The demonstration called for the international unity of autoworkers, linking the fight against plant closures with the ongoing militant struggle of maquiladora workers in Mexico and the broader struggles of the working class. The demonstration received statements of solidarity and support from workers involved in struggles in India, Sri Lanka, Mexico, Germany and Britain. In contrast, the response of the UAW to the closings has been a repetition of the failed and reactionary policies it has pursued over the last four decades. It has combined ferocious anti-Chinese and anti-Mexican chauvinism, including a boycott of vehicles assembled in Mexico, with pathetic protests to GM management, the Trump administration and Democratic politicians, and the organization of demoralizing candlelight vigils. After a delay of months, only last week did the UAW file a pro forma lawsuit over breach of contract terms for the plant closures. Significantly, the Detroit-Hamtramck facility was not named in the suit. The UAW has refused to organize a single mass protest, let alone industrial action, over the ongoing jobs massacre. Now UAW President Gary Jones has said that the union will make the plant closures an issue in the 2019 contract talks, a sure indication that the UAW is preparing to use the attack on jobs to press for further concessions. Workers must launch a counteroffensive in defense of jobs and decent living standards. This requires the building of a network of rank-and-file committees from every factory to launch a struggle independent of the UAW, including preparations for demonstrations, plant occupations and a national strike. Central to this is establishing the unity in struggle of autoworkers throughout North America, linking workers in the US, Canada and Mexico to fight for demands that workers need, not what the auto bosses and the UAW claim is affordable. This includes rehiring all laid off workers and victimized workers, abolishing all tiers, hiring temporary and contract workers as full time regular employees and a 40 percent wage increase to make up for decades of wage stagnation. The fight against plant closings and mass layoffs requires a frontal assault on the financial oligarchy, which has dictated the restructuring of the auto industry. The working class must mount a political struggle for socialism against the corporations and financial interests behind them. This includes transforming the auto monopolies and other transnational conglomerates into public enterprises, collectively owned and democratically controlled by the working class, in order to guarantee good paying and secure jobs, industrial democracy and workers control of production.